1. AMS to reimburse AUS $35,062.04 for accumulated Arts County Fair debt. Blake’s Broadcast: Lots of meetings with UBC admin; Block Party and Great Farm Trek; Hired a new assistant; Held student-staff appreciation lunch; New SUB negotiations with university are progressing, albeit slower than hoped for. VP Finance: Looking at some renos to get some more office space; Block Party brought in ~$100,000 in revenues, but expenses were a bit higher than that; recently resolved a student fee issue that resulted in AMS getting ~$500k they were due; Blue Chip will be getting renovations to be fully equipped to do chilled drinks over the summer. VP Admin: New SUB survey completed and results will be posted online soon in condensed, more readable form; new water fountains coming this month and will encompass both drinking fountains and bottle-filling stations; AMS will try to phase out bottled water at their outlets and sell AMS re-useable water bottles. VP Academic/UA: Has been liaising with RCMP regarding olympic security and liquor policy issues; Sgt. Dan Wendland is gone with replacement coming this month; UNA and RCMP are working on a noise by-law to bring to the province; has been talking to provost and CUPE about TA training issues; NSSE founder will be making presentation tomorrow; who wants ice cream? VP External: Lots of work on provincial election campaign; Translink AGM is coming up; looked into applicability of residential tenancy act on campus. ECSS: mostly has been doing a whole lot of hiring for the upcoming year. Code and Policy: Will look into why Code places restrictions on holding more than one AMS position at a time. Senate Appointments: Student Senate Caucus went through a number of applications, did some interviews and ended up picking Azim Wazeer, Joel Mertens and Josh Sealy. There was some concern about whether the advertisement for this position was done, but given that way more people applied for the appointments than for the elections seems to indicate something was done right. Motion passed unanimously. Joel Mertens returns to council as Senate rep. Awkward moment: Guillaume Houle tried to get Geoff Costeloe to say that the meeting to pick the new senators took place during a hockey game, to no avail. SUS Referendum Results: SUS recently had passed a referendum to index their student fee to CCPI (Canadian Consumer Price Index) and needs AMS to rubber stamp this. There are multiple versions of the CCPI; some debate over which one to use since it was not specified in the referendum question. Although SUS finances were admittedly fine, they feel is more sustainable and hopefully saves them from going to referendum every few years to raise it. SUS is the first constituency to index their fee to inflation. Motion passed. Arts County Fair Debt Repayment: As expected, discussion on this item was quite lengthy. I won’t summarize it right now and the arguments for and against are already known, I hope. Before I give myself carpal tunnel typing it all out, let’s see what the Ubyssey comes up with. End result: 23-7 in favour of repaying $35,062.04 to the AUS for accumulated Arts County Fair debt. Commitee Appointments: Sorry for the lack of last names, but Dave generally doesn’t put them up, so if I don’t already know it, it won’t be there. Also, I apologize in advance since I’m certain there is a mistake or two in here. AMS Preliminary 2009/10 Budget: 2008/09 highlights include higher than expected business operations revenue ($1.165M) contributing to an extra $440k which is to be allocated to other funds. However, with the food-housing merger, the AMS expects to lose some of its conference catering business to UBC Housing and Food next year. 08/09 ended with a small surplus. 09/10 forecasts $13.8M of revenue, with another small surplus at the end of the year. Point of interest: Rogers will no longer be providing free Blackberrys to AMS executives. 1. $21,900 for the Whistler Lodge, including: $1,800 for bunk bed improvements to combat bed lice; $6,600 for painting and patching walls; $9,000 for carpeting; $3,000 to build a boot storage area near the lodge entrance. 2. $16,000 to move, divide and create some new offices in the SUB for some of their employees. Code Changes 2009: VP Admin Assistant: Crystal gets to hire an assistant to maintain her sanity. This motion came from Matt Naylor. Background: AMS council meetings are always Wednesday evenings. Sometimes, motions would come up and councilors would claim that they were previously unaware of the motion or had not received supporting documentation. At Blake Frederick’s first meeting as president, he asked that agenda items be in by the previous Friday. This was misinterpreted as being a hard deadline imposed unilaterally, when Code actually says agenda items must be in 72h prior to the meeting, which would be Sunday 6 pm. Blake stated that he was merely trying to give councilors the courtesy of extra time to look things over; he has never rejected motions that come in after Friday but meet the 72h timeline; he will gladly follow council’s wishes on this topic; felt a bit slighted that the motion came the way it was, he thought it would have been more appropriate as an informal discussion period. Matt simply felt that sometimes committees need a bit more time to work on items and Friday was too early; he also didn’t intend the motion to sound as confrontational as it does; also felt that if the deadline needed to be changed it should come from Code and Policy, not the president. A lot of councilors appreciated having the weekend to go over agenda items and the extra time available to consult with constituents, if necessary. Andrew Carne advocated for the pragmatic solution: send out preliminary agendas on Friday with as much as possible included (especially the more involved motions) with the final agenda sent out Monday. Sounds like a good plan. Motion failed 15-3. External Lobbying: So maybe that $30,000 was not spent so well. This entry is too long already, so for background I will direct you to this Ubyssey editorial as well as a related radical beer tribune post. There was quite an in depth discussion, but I will kept it shallow cause I’m tired. The AMS external office recently released a report card on the parties’ platforms in this election which was up on the AMS website. It has now been removed, but I’ve uploaded it here. Rating the parties? That makes the AMS look partisan when they are not supposed to be; extremely partisan since the BC liberals got a big fat F. Council decided to pull the report card off their website, and not distribute it anymore. Also, have you seen ads like this around campus? 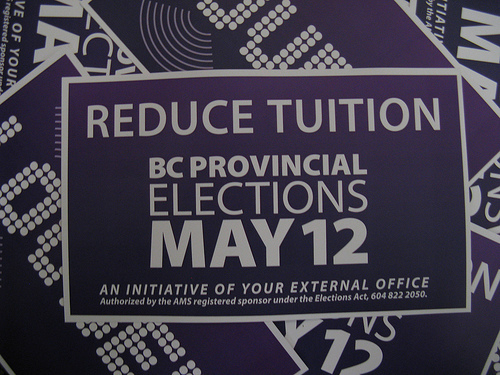 Well, AMS council never said that lowering tuition fees was one of the principles they were lobbying on in this provincial election, so these posters are misrepresenting the AMS’s priorities. Not to mention only the Greens are promising tuition reduction so it could also be considered partisan. All of these posters are to be taken down. Essentially, this boondoggle was all due to the fact that the external office didn’t follow proper procedures when putting together the campaign. It made a campaign based on the VPX’s priorities and judgement, not council’s or the External Policy Committee’s. So, the $30,000 spent on the provincial election campaign? A waste of resources on a partially botched campaign and the AMS admits it. Class dismissed. Next Meeting May 27.